The Justice Department has sued California over provisions of state law that it says inhibit enforcement of federal immigration laws. The lawsuit, filed Tuesday, is the first salvo in a new federal effort to aggressively enforce immigration statutes. The suit names California, Gov. Jerry Brown, and state Attorney General Xavier Becerra as defendants. Brown and Becerra are both Democrats. The suit, at a general level, is a constitutional challenge to the state’s sanctuary laws. California has adopted laws that undermine powers the Constitution delegates to Congress exclusively, the Justice Department said. California will likely reply the provisions aren’t truly in conflict with federal law and President Donald Trump’s administration cannot coerce state agencies into compliance with federal goals. The latter concept is referred to as anti-commandeering. 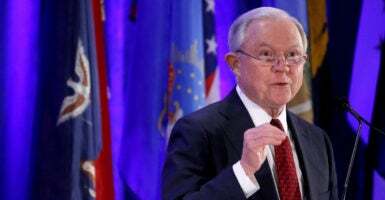 The Justice Department argues these statutes inhibit enforcement of two federal laws: the Immigration and Nationality Act and the Immigration Reform and Control Act. These laws govern the entry, status, and removal of foreign aliens and set forth federal authority to investigate, detain, and deport illegal immigrants. The Immigration Reform and Control Act particularly bans the employment of illegal aliens. The first law prohibits private companies from voluntarily cooperating with immigration authorities in several important respects. It forbids employers from sharing records about legal status or allowing immigration agents into “nonpublic” business spaces without a warrant and requires supervisors to warn employees in advance of immigration inspections. The successful enforcement of the Immigration and Nationality Act and the Immigration Reform and Control Act, the complaint notes, assumes cooperation and collaboration between federal, state, and local agencies. The second law gives the attorney general of California significant power to investigate certain facilities where immigrant detainees are housed. Private prisons and local detention centers, through contracts with the federal government, quarter foreign nations pending deportation proceedings. The law allows the attorney general or his designee to audit these stations for compliance with state safety laws, as well as the due process provided to detainees and the circumstances surrounding their apprehension. The DOJ claims no other federal subsidiary in California is subject to such heightened scrutiny. The primary purpose of these intrusions is to slow the administration of the removal process, the complaint suggests. The third law limits the scope of cooperation between federal and local law enforcement with respect to the immigration status of individuals in California’s custody. The government often waits to deport criminal aliens until the conclusion of their jail terms. State and local officials, under the terms of the law, may not disclose a prisoner’s personal information to federal immigration authorities, with certain exceptions. What’s more, the third law requires the federal government to present a warrant before the state will release criminal aliens to federal custody. Federal law relies on a system of civil administrative warrants for immigrant arrest and removal and does not use judicial warrants, which can be harder and more time-consuming to obtain. “These provisions impermissibly prohibit even the most basic cooperation with federal officials,” the lawsuit says. The lawsuit, at several points, quotes a 2012 Supreme Court decision, Arizona v. U.S., which struck down rigorous state laws meant to enhance enforcement of federal immigration statutes. The three provisions in question made it a state crime to be unlawfully present in the U.S., allowed warrantless arrests of suspected unlawful immigrants, and enjoined illegal immigrants from holding or searching for jobs. A five-justice majority explained Congress has broad power to set and enforce immigration law and federal statutes must prevail over state measures where the two conflict. Those same principles are applicable here, the DOJ argues. California works in concert, not in opposition, to federal law and state entities cannot be used in furtherance of federal policy goals, Becerra said when speaking via phone to reporters Tuesday night.